A sad story might be taking a turn for the better about Glenn Johnson, the voice of your Cougars. He was hospitalized on Sunday with stroke-like symptoms and very little was known. Now, however, the news is heading in the right direction. He’s now doing much better per his wife, and the diagnosis sounds as though it was merely a severe blood-pressure spike with some short-term memory loss. “Johnson’s wife, Kathy, told the Associated Press his prognosis is good. Johnson’s speech apparently has not been affected.” SWEET! I can’t wait to hear “and that’s another….Cougar….FIRST DOWN!” And of course…..”HERE….COME……THE COOOOOOOOOOOOOOOOGS!” A crisp fall Saturday in Pullman just wouldn’t be the same without the Mayor, so, get well soon, rest up, and we’ll see you in early September. Did you all see the article and video about the current state of Martin Stadium? This latest phase is really coming together. I really enjoyed the first phase last fall, as I know many of you felt the same, but this next phase is really doing to make things look different. Mix in the Cub renovation and man, the gameday experience could be a lot different this fall. I’m thrilled with the eye-candy talk, re: scoreboard. $2.5 million, including a new sound system? Very nice. Still no pics of the actual scoreboard, but most of you have seen the powerpoint. Finally, Cougfan has an article about recruiting in the state of Washington and how the new WSU staff is going to go after it. It’s a premium article so you know the drill, we won’t link to it here. But it goes in line with something I’ve been thinking about and have discussed with my UW brother-in-law for a while now. The bottom line is the state of Washington is a HUGE factor, for our success and UW’s. Think about this. Go look at the rosters from our glory 01-03 run. Yes, Gesser was a huge part of that, the MVP in school history. But remember the offensive line? Tyler Hunt, Derrick Roche, etc, all in-state guys. How about on the other side of the ball? Acholonu, Jeremy Williams, Marcus Trufant, Rien Long, Erik Coleman, Will Derting, etc. All guys from in-state, all major factors in our best of times. Now think back to the last few seasons. Who were our better players? Jason Hill, Michael Bumpus, Jerome Harrison? How about Alex Brink or Josh Swogger? All out-of-state guys. Now you do have to add Mkristo Bruce and Scott Davis in there, both in-state guys. But in truth, they were part of the Price era. 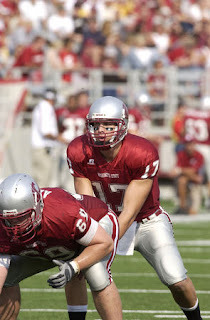 Bruce was a redshirt in ’02, and Davis was part of the ’03 class but was fully committed to WSU in ’02, when Price recruited him. It’s as if the struggles of our program didn’t just happen because Price left. We were suddenly losing out on the in-state guys, the gems that were discovered by turning over rocks. It’s as if our tough times of late have coincided when the absolute core of the team came from out of the state. Now, one could argue that Doba did a better job on in-state kids the last few years. It’s easy to look at our roster right now and realize that Brandon Gibson is our best player and if he stays healthy, he will most likely be a first-day NFL draft pick in ’09. How about Andy Mattingly? He’s got the look of a defensive MVP for ’08. Kenny Alfred is an excellent center and some have pegged him as having an NFL future since his true frosh season. And Gary Rogers, if things keep going in the right direction, in this new offense could simply EXPLODE next year. All four kids, all probably regarded as our best players, all from Washington. Maybe it makes a lot more sense about how Wulff has talked so strongly about recruiting the state, how important that is. That isn’t just chatter for press releases or message boards. It’s as though he totally “gets it” in how important Washington is to the program. And the best part for that effort is how well regarded Wulff is among high school coaches in Washington. Remember, the press release when Wulff was hired had quotes from an in-state high school football coach. His reputation while recruiting for EWU is outstanding, and clearly an asset for the future of this program. It might not happen overnight, but it WILL happen with Wulff! Just have some patience and enjoy the steps in the rebuilding effort. You are currently browsing the archives for the Glenn Johnson category.